When my son was about two years old, he would often get upset trying to figure out a new toy — like most toddlers (and let’s be honest, most grown-ups) do. One afternoon, both of us seated on the green and blue squares of the playmat, he tried to shove a circle-shaped block into a square-shaped hole. He wailed, he flailed, and then he threw the block across the room. I think this is good advice for grown-ups too. Because there comes that moment for all of us when we just can’t get that circle-shaped block into the square-shaped hole. We used to be able to! It worked just fine yesterday, but now, today, for some reason, it won’t go. So what most of us do, especially as women, is try HARDER. We shove, we stay at it longer, we use force. And sometimes it works. Sometimes the hard work, willpower, and hustle pays off. We get the raise, the trophy, the recognition. We pull off some damn impressive stuff. But what about when it no longer works? What about when all the things that used to work stop working and start making us soul-sick? When no matter how hard we try, the circle-shaped block just won’t fit in the square-shaped hole. I know this is hard. Scary even. Disheartening. But it is also good news. You’ve been trying HARDER, but what if this is a nudge to try DIFFERENT? We live and work in a world that is built for what I call “Masculine Genius” — our thinking, logical, willpowered, competitive abilities, abilities that each of us have, regardless of gender. We also live and work in a world that disregards what I call “Feminine Genius” — our feeling, intuitive, joyful, connective abilities. 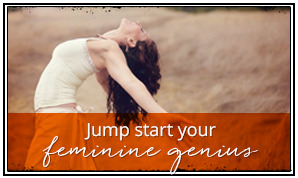 We all have Feminine Genius within us, but women I think are hit particularly hard by the oh-so-popular trend of leading with our Masculine Genius and abandoning our Feminine Genius. 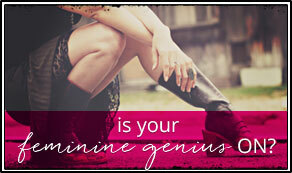 I often think of Feminine Genius as a circle and Masculine Genius as a square. 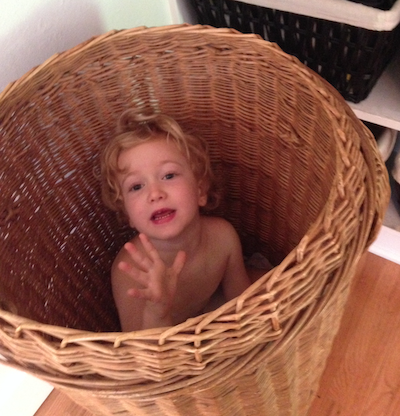 And like the circle-shaped block my son couldn’t fit into the square-shaped hole, many of us are feeling like we’ve been trying to fit ourselves into an ill-fitting way of living, loving, and working … and it’s no longer working. Most of us have been taught that the best way to do our work in the world, to get ahead, or to make it, is to think (not feel), to use willpower (and worry about enjoying yourself later), to use reason (and disregard intuition), and to compete (not connect). 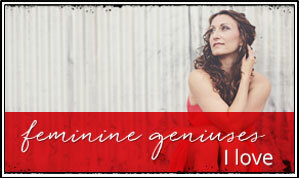 Most of us have over-developed Masculine Genius and badly under-developed Feminine Genius. So what I want to say today is pretty simple. While I really see your confusion and pain and upset — because WFT??? What used to work for you is no longer working! — it just might be time to try DIFFERENT. What if you stopped trying to shove the circle-shaped block into the square-shaped hole and tried out some Feminine Genius stuff? What if you put your feeling body before your thinking mind? So that the next time you cry, you don’t apologize. What if you put your pleasure before your productivity? So that the 30 minute walk in the fresh air — that you usually leave for last but that brings you such joy and focuses you for the rest of the day — is something you put in indelible ink in your daily calendar and all those other important to-do-s get slotted in around it? What if you put your intuition before logic? So that the next time you get that nudge in your belly — to stop working on your dissertation or to stop doing the dishes and just head to bed — you follow it? What if you put connection before competition? So that the next time you go out with a friend you trust, you share what’s REALLY going on for you — and bask in the hallowed space of two tender souls allowing themselves to be touched? I’m not sure if it was that day or whether it was after a few more tries with the blocks, but eventually my son found the circle-shaped hole that the circle-shaped block fit easily into. We did a joyful and satisfying high-five. Come on over to the discussion and share with us how all this strikes you, would you? This entry was posted in Blog on October 15, 2018 by anne.